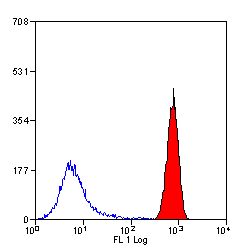 Mouse anti Rabbit CD11b antibody, clone 198 (MCA802GA) used to assess CD11b expression levels on rabbit mononuclear cells by flow cytometry. Analysis of in vivo BrdU incorporation. Rabbits were treated as described in Fig. 1. PBMCs were collected at days 11, 15, 17, 20 and 24 post-inoculation, while mononuclear cells were isolated from popliteal lymph node and spleen at the time of death. Cells were labelled with anti-CD11b, IgM, CD5, CD4 and CD8 mAbs as the primary antibodies. Alexa 633-GAM was used as the secondary antibody. In vivo BrdU incorporation was revealed by immunofluorescent staining as described in Methods. After staining, cells were analysed by flow cytometry. A. Representative flow cytometry dot plots are shown for each double staining, they illustrate the data obtained at day 17 post-infection for the PBMC of rabbits MR17/1 and IR17/1. The data represent the percentages of BrdU positive cells (y-axis) calculated based on the acquisition of 10,000 cells expressing the indicated cell marker (x-axis). B. The percentage of BrdU positive cells amongst the indicated cellular subset was determined and compared between AlHV-1 infected (left column: bold lines; middle and right columns: hatched bars) and mock infected (left column: dotted lines; middle and right columns: open bars) groups (* P<0.05; **P<0.005, *** P<0.0001). In the left column the following symbols were used: ▴, MR17/1 and IR17/1; ▭, MR17/2 and IR17/2; ●, MR20 and IR20; ○, MR24 and IR24. 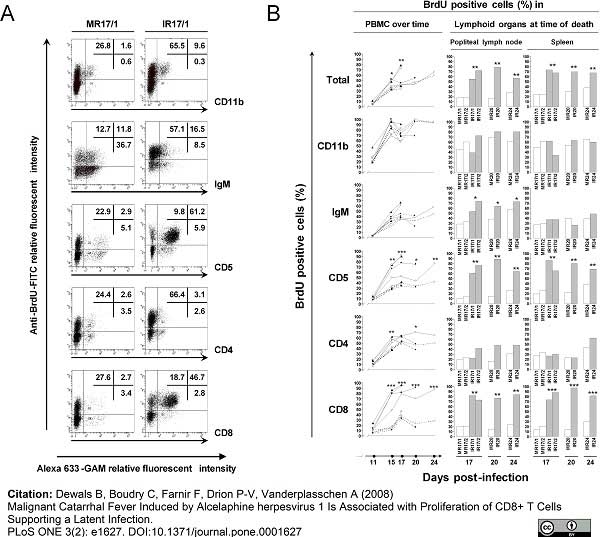 Malignant Catarrhal Fever Induced by Alcelaphine herpesvirus 1 Is Associated with Proliferation of CD8+ T Cells Supporting a Latent Infection. Mouse anti Rabbit CD11b antibody, clone 198 recognizes the rabbit CD11b cell surface glycoprotein, also known as the integrin alpha M chain and MAC-1. Mouse anti Rabbit CD11b antibody, clone 198 immunoprecipitates two proteins of molecular weight 165 kD and 95 kD from granulocytes. It recognizes monocytes, macrophages and neutrophils by flow cytometry and is thought to be against the homologue of human CD11b. In immunohistochemistry good staining of macrophages is observed. Spleen cells from immunised BALB/c mice were fused with cells of the SP2/0.Ag14 mouse myeloma cell line. Use 10ul of the suggested working dilution to label 106 cells or 100ul whole blood . Smet, E.G. et al. (1986) Mab. 198: a monoclonal antibody recognizing the complement type 3 receptor (CR3) in the rabbit. Wilkinson, J.M. et al. (1993) Immunohistochemical identification of leucocyte populations in normal tissue and inflamed synovium of the rabbit. J Pathol. 170 (3): 315-20. Hoefer, I.E. et al. (2005) Aspirin, but not clopidogrel, reduces collateral conductance in a rabbit model of femoral artery occlusion. J Am Coll Cardiol. 46 (6): 994-1001. Vinukonda, G. et al. (2010) Neuroprotection in a rabbit model of intraventricular haemorrhage by cyclooxygenase-2, prostanoid receptor-1 or tumour necrosis factor-alpha inhibition. Brain. 133 (Pt 8): 2264-80. Xu, Y. et al. (2010) Adenovirus-mediated overexpression of glutathione-s-transferase mitigates transplant arteriosclerosis in rabbit carotid allografts. Brickson, S. et al. (2003) M1/70 attenuates blood-borne neutrophil oxidants, activation, and myofiber damage following stretch injury. J Appl Physiol. 95: 969-76. Georgiadis, P. et al. (2008) Characterization of acute brain injuries and neurobehavioral profiles in a rabbit model of germinal matrix hemorrhage. Gillet, L. et al. (2009) Anchoring tick salivary anti-complement proteins IRAC I and IRAC II to membrane increases their immunogenicity. Vinukonda, G. et al. (2016) Hyaluronidase and Hyaluronan Oligosaccharides Promote Neurological Recovery after Intraventricular Hemorrhage. J Neurosci. 36 (3): 872-89.